Welcome to Alaska! Or, as you may hear it called, the "land of the midnight sun." No matter the name, one thing is certain: This state is massive. And with nearly 600,000 square miles, Alaska is filled with so much to see and do. As you make your way through the Great Land, whether by land, plane or sea, you'll likely be greeted by mountains in almost every view. 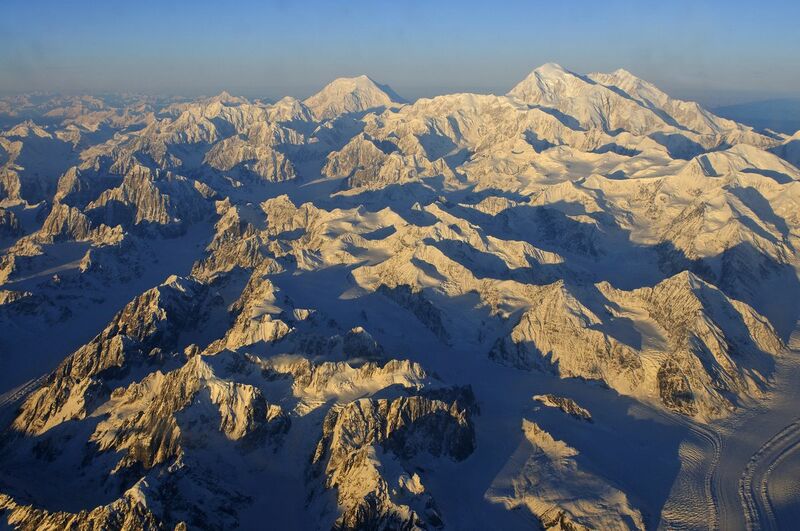 Alaska is home to 39 mountain ranges, including the Chugach, Alaska, Kenai, Talkeetna, Aleutian and Tordrillo ranges. On a clear day you may even be able to see the tallest mountain in North America, Denali, towering at a whopping 20,310 feet. (Denali is an Athabascan name that translates to "the high one.") The nation's second-tallest mountain, Mount St. Elias, stands at 18,008 feet and is nestled on the Alaska-Canada border. Another nine of the 16 highest peaks in the country can be found within Wrangell-St. Elias National Park and Preserve. Speaking of national parks, Wrangell-St. Elias National Park – at 13.2 million acres – is the largest national park and just one of the 17 national park systems in Alaska. Alaska is also home to some of the biggest national forests: Tongass National Forest, which spans 16.8 million acres, is the largest. Chugach National Forest is the second largest at 5.4 million acres, roughly the size of New Hampshire. Alaska stretches far across the globe, including both the northernmost and westernmost points of the United States, with Point Barrow jutting into the Arctic Ocean and Cape Wrangell situated on Attu Island in the Aleutian Chain. This habitat of massive mountains, substantial forests and gigantic glaciers – about 100,000 icefields dot the landscape – is home to wildlife that measures up to the monumental terrain. The largest male mountain goat was found in Alaska and weighed in at 385 pounds. A world-record setting 459-pound halibut was caught in Unalaska Bay in 1996. Not to mention the bears the state is famous for. Animals and geography aren't the only interesting things about Alaska – its history is full of fascinating people and stories. Secretary of State William H. Seward signed the treaty marking the purchase of Alaska from Russia on March 30, 1867 – now commemorated in March as Seward's Day. Nearly 85 percent of Alaska's budget is supplied by oil revenue, stemming mainly from the 800-mile long trans-Alaska pipeline, which began transporting oil from Prudhoe Bay to Valdez in 1977. Across the state, flagpoles fly the design of a blue field dotted with the golden stars of the Big Dipper constellation and North Star – a design created by a 13-year-old Alutiiq boy named Benny Benson as part of a statewide contest in 1927. Eleven Alaska Native cultures – Inupiaq, St. Lawrence Island Yupik, Yup'ik, Cup'ik, Unangan, Alutiiq (Sugpiaq), Althabascan, Eyak, Haida, Tsimshian and Tlingit – span the state. Each day of your travels, you'll learn something new about Alaska, whether you're cruising the waters near Juneau and other fishing villages along the panhandle, meandering the city trails and storefronts of Anchorage, hauling north toward the Golden Heart City of Fairbanks, or going even farther. Welcome and enjoy this journey through the Last Frontier.